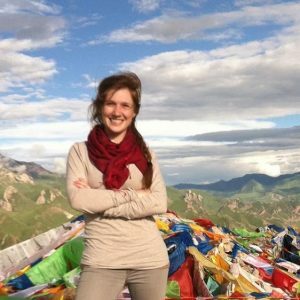 Elizabeth is a PhD candidate in the History-East Asia Program focusing on Tibetan and Chinese History. Her research interests include economic and social history of Tibet from the 19th to 20th centuries with particular focus on monastic economies, currency, taxation, labor systems, and trade networks in Tibet and East Asia. Her dissertation, tentatively entitled “Taxing the Tsampa-Eaters: Monastic Economies and Transportation Infrastructures on the Sino-Tibetan Frontier 1911-1959”, delves into the world of Kham, a Tibetan region at the epicenter of Chinese and Tibetan political struggles of the 20th century. Supported by a SSRC-IDRF fellowship, Elizabeth conducted field and archival research across China, Taiwan, and India from 2016 to 2017. She received her BA from Barnard College, Columbia University in 2011, and prior to joining Columbia University in 2013, studied Tibetan language and Buddhist scroll painting at Qinghai Nationalities University as a Fulbright scholar.